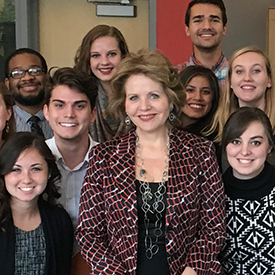 Knowing that Renee Fleming would be performing nearby, music students from St. Olaf College were eager to take part in the experience. That’s when Nick Swanson and J.W. Keckley, co-presidents of the St. Olaf Chapter of Student NATS (National Association of Teachers of Singing), got to work. Their perseverance paid off. The students enjoyed a personal meet and greet with the opera star, following her recital in October for the Schubert Club’s International Artist Series in St. Paul, Minn. The next day, the students attended a master class by Ms. Fleming at MacPhail Center for Music in Minneapolis. Ms. Fleming’s master class was an incredible experience. From the second she stepped onto stage, students were captivated. Four graduate-level singers performed arias for her, and she offered insightful criticism and shared a great deal of her philosophy on music-making. They learned not only how generous of a performer and person she is, but quite a bit about making it in today's opera industry. At the conclusion of the program, a staff member ushered the St. Olaf students downstairs to a secluded room and informed them that the world-famous soprano herself would soon be fielding their questions. Her generosity proved to be true as she spent an extra 20 minutes with the St. Olaf students, talking about the transition from undergraduate to graduate school, what to look for in a voice teacher, and how to market oneself in today's world. She was as personable as could be, and seemed to take great pleasure in sharing the knowledge she's amassed over the years with a younger generation. Each St. Olaf student left awe-struck at meeting an idol, but with concrete advice to take forward.